Editor's Note: This post was originally published in June 2014 and has been revamped and updated for accuracy. According to Mr Breakfast “People who regularly consume breakfast eat 12% healthier throughout the day [and] are less likely to become obese.”, yet a shocking 31 million Americans regularly skip breakfast! Don’t make the mistake of skipping the first and most important meal of the day. Aim for approximately 400 calories per breakfast and make sure you eat something that is high in protein and fiber, and low in sugars and processed carbs. Look for steel cut or rolled oats and try to avoid instant varieties as they have less nutritional value. Cook according to packaging, add fresh fruit like berries, bananas, peaches, or apples. Or sprinkle on nuts and dried fruit. Add milk and drizzle with honey or sprinkle with cinnamon on top. Gluten Free Option: use cooked quinoa instead of oats. 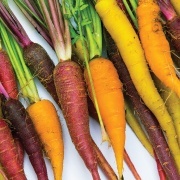 Use your favorite healthy protein powder, add 1 cup ice, ¾ cup water, and your favorite fruits or veggies like: kale, spinach, blueberries, strawberries, bananas, apples, pears, pineapple, beets, carrots, celery, oranges, or peaches. Mix in blender until smooth. Add flax seeds, almonds, or chia seeds for crunch. Use a scoop of yogurt for a creamy texture. Dairy Free Option: use silken tofu instead of yogurt. Mixing 2 eggs in skilled with coconut or olive oil, scramble with spinach, tomatoes, mushrooms, or onions. Sprinkle with cheese like: feta, parmesan, or low fat cheddar. 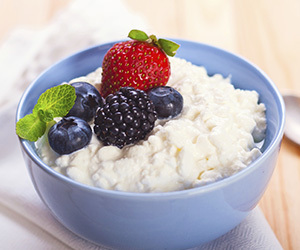 Scoop about 1 cup low fat cottage cheese and serve with fresh fruit like berries, grapefruit, or cantaloupe. If you prefer a more savory breakfast, lightly grill tomato slices or cooked beets and mix into cottage cheese. Use an online caloric calculator to determine your suggested daily calories, or speak with one of our Certified Personal Trainers to get started on a health and fitness plan designed for your specific needs. You can also download this Healthy Grocery Checklist to help you get the best food for your body’s fitness and dietary needs.